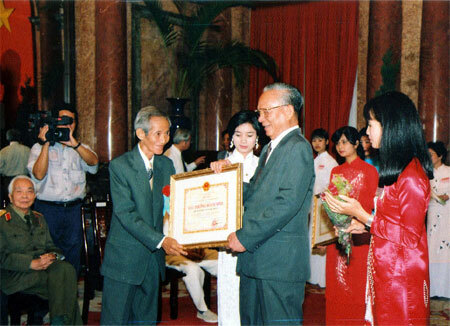 What an honour: War photographer Lam Hong Long was presented the Ho Chi Minh Literature and Arts Prize by President Le Duc Anh in 1996. The name Lam Hong Long is often the first one mentioned whenever people talk about news agency photographers. He captured timeless images that had great social influence during the course of his career. 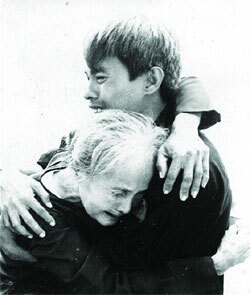 The photo titled "Mother and Son Reunite" he took on May 4, 1975 in Vung Tau City recorded the reunion of an ex-Con Dao prisoner and his mother after many years of separation. We met Le Van Thuc, the man in the photo, in Ben Tre Province. He received us warmly and said: "I've been waiting for days to have a chance to talk with the Vietnam News Agency." In a small, cozy house, "Mother and Son Reunite" is framed in a glass case in the living room under the family altar dedicated to his dear mother. She had cried her heart out when her only son was sentenced to death after being accused of being a Viet Cong spy. Somehow she managed to remain strong, and after learning her son had been exiled in Con Dao Prison, a true "hell on earth", she started to investigate the situation. Upon hearing the news from the Liberation Radio that prisoners were to be released from Con Dao, she travelled all the way from Ben Tre to Vung Tau in search of her son. Thuc was one of 36 prisoners together with a number of women and invalids who boarded a ship to return to the mainland after the country was liberated. "At about 6pm on May 3, we left the island and reached land the next morning. We were taken to the Rach Dua Police to wait for our relatives. "At about 10 am the next day, I was told one of my relatives had arrived. I walked out of the building and was stopped in my tracks. My eyes filled with tears as I saw my mother standing there in a black ba ba blouse. I rushed to embrace her. After so many years apart, we were so happy to see each other again. We cried and cried!" "Actually I saw the photographer at the time, but I ignored him. He took photos of a lot of people there, not just us. "I saw the photo for the first time in Nhan Dan newspaper many years later after the photographer won the Madrid International Photo Competition. Only then did I realise he was a Vietnam News Agency reporter." In 1992, Le Quang Vinh, also an ex-prisoner of Con Dao, organised a delegation to visit the North, where many reporters interviewed Thuc and wrote articles about him. HTV also made a documentary film titled The Portrait of a Condemned Prisoner. Journalist Lam Hong Long was born in 1926 in Phuoc Loc Commune, Binh Thuan Province and died on March 21, 1997. In 1954, he was moved to the North to become a photographer for the Vietnam News Agency. In 1975, he joined the Ho Chi Minh Offensive and was present at the victories in Hue, Da Nang, Nha Trang, Bien Hoa and Sai Gon. He was presented the Certificate of Honour (Mencin Honor) at the 21st Congress of the International Federation of Photographic Art (FIAP) in Spain in 1991 for "Mother and Son Reunite". Lieutenant Le Van Thuc's fate was decided in April 1968 during a court-martial at Tactical Command 4 where he was sentenced to death for spying for the North. In November 1968 he was sent to Con Dao Island and jailed in the condemned prisoners' area. During the seven years he spent in prison, he endured constant torture, but he stood firm. Now at 73, he still looks healthy and brisk. After his release, he still faced many difficulties because he had been away for so long. He sent a request to the Ben Tre Provincial Party Committee and eventually, they reinstated him as a Party member. In 1977, he was given a job at the Department of Industry and Trade in Chau Thanh District, and day in and day out he was given different jobs around the area. He finally retired in 1991. Luckily, his wife Lam Thi Hong Anh was always by his side during those difficult days. He now lives a simple life in a hamlet in Chau Thanh District, and his son and daughter are married with stable jobs. "I really wanted to meet photographer Lam Hong Long, and in 1994, Long and a film crew from Ben Tre Television came to visit me, and my wish was satisfied," Thuc said. "In 1996, I visited Lam Hong Long in Thong Nhat Hospital. I saw the picture of me and my mother hung by the window. He showed the photo and tried to say: 'This photo had the greatest significance on my photographic career.' Three days later, I was informed of his death." As Thuc talked to us, his eyes welled up. For him, thanks to the predestined meeting with photographer Long, the Vietnam News Agency has always been dear to him, even though he has never set foot in their offices.